In solidarity with Charlottesville DSA as well as all impacted by the fascist violence one year ago — and in remembrance of Heather Heyer — New Orleans DSA is using this Medicare for All Weekend of Action to host a Protest Health & Safety Training with the help of our local street medic collective. For those at that protest who suffered injuries and trauma, health injustice is an urgent, concrete, and ongoing crisis. Even with single-payer, we will need to know how to take care of ourselves and each other. We’ll need to know how to offer healing and wellness to our communities in times of trouble. Today, we’ll be learning skills to keep each other as safe as possible in compromising situations, and we’ll discuss how to support one another’s wellness on an ongoing basis. We’ll be thinking of Heather and Charlottesville as we do so, and will collect money for the Charlottesville Resilience Fund. 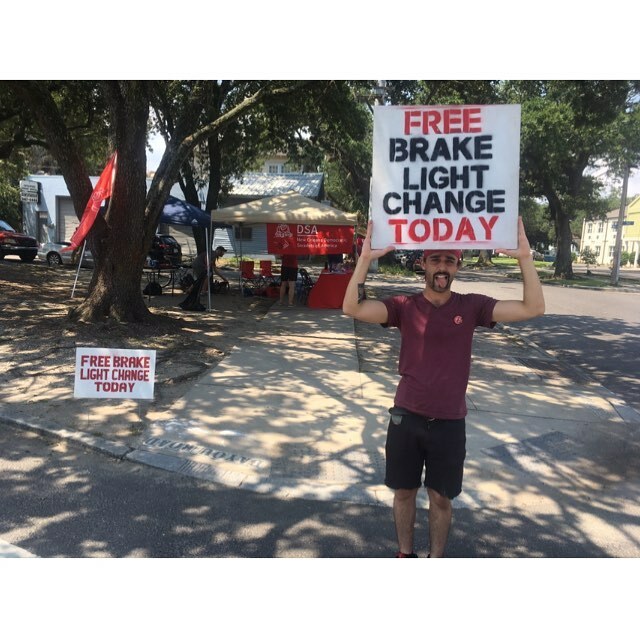 The New Orleans DSA’s monthly Gimme A Brake (Light) event on Saturday, July 28, drew a grateful crowd eager to talk about over-policing in the community and get free brake lights. The clinic drew a wide array of participants, from a Tulane law student working on criminal justice reform who said, “Socialism is great,” to a pregnant hairdressing business owner and her fiancé, who both needed bulbs replaced. One man was moving to Atlanta with his wife to be closer to his children and needed his brake light fixed so he wouldn’t be pulled over on the long drive. I'm interested in getting involved! Just send me DSA504 updates.